Jane's Journey Part 4, and More News on JE '06? And now we have James Barbour's interview from the November 6th episode of Broadway Beat 2000. A special thanks to 'English' and Kathey for helping me date this piece. James Barbour (Mr Rochester): I had read the novel three times- the third time just before I went to do La Jolla, and that time with Rochester in mind. And I just realized at that point that- I mean, I've done roles like Billy Bigalow and The Beast. Billy Bigalow is a multidimentional role and he's always on all the time. The difference is this man has probably thirty more layers than Billy Bigalow does. And once I got in production, once we got in rehearsal I realised how- I mean, he's delicious! And that's what I gravitated to but it's the darkness, the happiness, the torture, the love, the unrequited love, I mean just unbelievable levels. And trying to make them all fit into one character was the challenge- and it still is the challenge. That's what I enjoy about it. Next time, Mary Stout (Mrs Fairfax)! 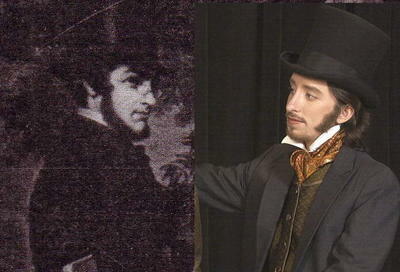 For more on James Barbour and Rochester, see the post entitled Actors on Playing Mr Rochester Part 3. Next, mysticgypsy informs me that she has recieved word from the BBC Drama webteam that there are no plans to produce either 'Jane Eyre' or 'Villette' anytime soon. This is no cause for alarm, I think. My friends discovered that the BBC was planning on releasing the 1973 production after months of hearing that they had no plans to. I stumbled across this film adaptation while trying to find more information on the 1970 production of Villette. 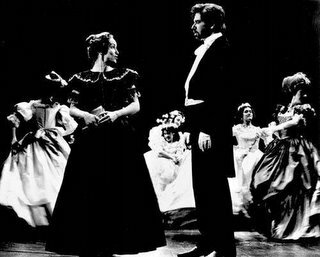 It turned out haply that Bryan Marshall, the actor who played Dr. Graham Bretton in Villette, also played Gilbert Markham in this 1968 production of The Tenant of Wildfell Hall! He is also well known as Captain Wentworth from the earliest available BBC production of Persuasion by Jane Austen- and he was in Vanity Fair. A brand new adaptation of Charlotte Brontë’s Villette can be seen at the Stephen Joseph Theatre, Scarborough from 20 October – 12 November. Presented in association with Frantic Assembly, Villette is the SJT’s tribute to Charlotte Brontë on the 150th anniversary of her death. A new life beckons for Lucy Snowe, who leaves behind her past and flees from England. As a teacher in a school in the town of Villette, Lucy is faced with a world of coquettish schoolgirls, a fierce headmistress and stories of a ghostly nun who haunts the dormitories. It is enough to push her fevered imagination to the edge, enduring fire, storms and unrequited love. But could a happy ending be in her grasp? Villette is Charlotte Brontë’s most autobiographical novel, based on her experiences when travelling through Europe where she fell passionately and dangerously in love. Her last completed work, Villette was written after the death of her sister Anne, who is buried in Scarborough. Villette is adapted by Lisa Evans, whose other adaptations for stage include Anne Brontë’s The Tenant Of Wildfell Hall and Daphne Du Maurier’s Jamaica Inn. Director Laurie Sansom combines the powerful text with choreographed movement provided by theatre company Frantic Assembly. The award-winning Frantic Assembly stand at the forefront of modern British physical theatre and over the past 10 years have become one of the most pioneering and exciting companies in the UK. The movement directors on Villette are Scott Graham and Steven Hoggett, who are founder members and joint Artistic Directors of the company. The Stephen Joseph Theatre was founded 50 years ago and was the UK’s very first theatre-in-the-round. The SJT is led by Artistic Director Alan Ayckbourn, the world’s most performed living playwright. One of the few new writing venues in the country, the SJT also produces innovative adaptations of classics.